On Wednesday, September 9, Garet died at home. He had been living with AIDS. A tireless runner, activist and advocate, Garet worked as the assistant director of Bay Area Communication Access. He held sign language interpreter certification from the Registry of Interpreters for the Deaf. Garet was extremely active in the deaf community and the Northern California Registry of Interpreters for the Deaf. He was one of the founders of the Deaf AIDS Center. He received the Bridge award from Deaf Services Network – North in 1990. Garet was an outstanding athlete, participating and winning medals at the Gay Games. He assisted the Names Project with interpreting, and he participated in civil disobedience during the 1987 March on Washington with the Queer and Present Danger Affinity Group. He is survived by his other, Mary Combs, of New Jersey; his father, James Stark, of Florida; his sisters and two brothers; several nieces and nephews; and many friends. A celebration of Garet’s life will be held on October 10 at St Benedict Center, 2891 Bush St., SF at 2 p.m. Contributions may be made to Deaf Services Network – North, Bay Area Communications Access, or the Northern California Registry of Interpreters for the Deaf. for the impending 10th anniversary of the SF Track & Field Club. 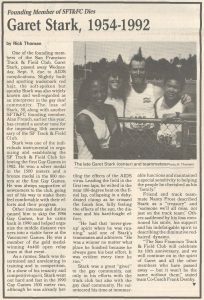 Stark was one of the individuals instrumental in organizing and establishing the SF Track & Field Club following the first Gay Games. He was always supportive of newcomers to the club, going out of his way to make them feel comfortable with their efforts and their progress. Other interests and duties caused him to skip the 1986 Gay Games, but he came back in 1990 and help organize the middle distance runners into a viable force at the Vancouver Games. He was a member of the gold medal-winning 4×400 open relay team at that event. As a runner, Stark was determined and unrelenting in training and in competition. In a show of his tenacity and competitive spirit, Stark went out hard and fast in the 1990 Gay Games 1500 meter run, although he was already battling the effects of the AIDS virus. Leading the field in the first two laps, he wilted in the near 100-degree heat on the final lap, collapsing in a dehydrated clump as he crossed the finish line, fully feeling the effects of the sun, the disease and his hard-fought effort. Friend and track teammate Nancy Frost described Stark as a “treasure” and “someone we’ll all miss, not just on the track team.” Others saddened by his loss mentioned his smile, his support and his indefatigable spirit in describing the diminutive red-haired dynamo. “The San Francisco Track & Field Club will celebrate its 10th anniversary, and we will continue on in the spirit of Garet and all the other members who have passed away – but it won’t be the same without them,” state team Co-Coach Frank Demby.